In my last post on Word & Sign, I described the struggles of Charles Jean-Marie La Fonta to become the first deaf priest, including his decades of training in elocution and rhetorical delivery. Fr. La Fonta’s greatest handicap was not his inability to hear but rather the misconceptions of society about deaf people in general. Once Fr. La Fonta had broken through this barrier, he began immediately to minister to the deaf in France. As the first deaf priest, Jean-Marie La Fonta helped show the world that it was possible for deaf people to master languages and every subject matter studied by hearing people. But more importantly, he showed the world that deaf people have a need to use their personal talents and strengths, just like anyone else, by giving back as full members of society. Dear Lord, I will be your priest. I shall also be the deaf-mutes’ priest, teach them your commandments, and lead them on the way to you. Only two days later, La Fonta visited the deaf students at an institute for the deaf at rue de Manille, Paris. He joined the children on the playground and talked to them about how happy he was to be their priest. After this school, he visited others, including the National Institute for deaf girls in Bordeaux and the Institute for the Deaf in Poitiers. At every school, the children were delighted to greet the priest who was a “deaf-mute” like themselves. In his work with the deaf in France, Fr. La Fonta traveled constantly and worked tirelessly for the remainder of his life. Although Mme. Chaunac-Lanzac’s biography does not say much about his methods of preaching, the question arises: did Fr. La Fonta speak to the deaf with his well-trained voice or did he use sign language? The answer is surely that he used both and adapted to the needs of his audience. The school La Fonta had attended as a child, the Institute for Deaf-Mutes in Bordeaux, was the famous school founded in 1760 by Abbé Charles-Michel de l’Épée, somewhat erroneously known as the inventor of sign language. L’Epee did not actually invent signs for the deaf. He adapted signs that he learned from a community of deaf people in Paris for use in his school’s “Instructional Method of Signs.” This method included verb endings, articles, and prepositions in an attempt to communicate in French using the hands. This is similar to today’s Signed Exact English. L’Epee’s method of teaching the deaf was based on the natural principle that education for the deaf must teach through the eye what other people learn through the ear. Fr. Jean-Marie La Fonta knew both spoken French and sign language for the deaf, after his early education at the Institute under its second headmaster Fr. Cucurron Sicard. What a tribute it must have been when, for a centennial celebration in honor of Fr. Sicard, Fr. La Fonta offered his first public Mass in spoken French. The people heard him clearly say the words of prayer for his benefactor. At a reunion in Poitiers, Jean-Marie gave the homily at Mass. He spoke very distinctly and used sign language. Everyone understood him and appreciated the things he spoke about. His love for the deaf could be seen in everything he did. Jean-Marie knew only too well the needs of the deaf-mutes. They needed to be accepted in society, to overcome the sense of rejection, to be at peace with themselves. In addition to his religious services, Fr. La Fonta spoke out about education for the deaf. Although he used and appreciated sign language, he was an advocate of new scientific and technological advances that might encourage the deaf to understand the spoken word, to read languages based on the spoken word, and also to speak to people in society at large. In July 1926, he wrote a paper for the General Assembly of the Association for the Deaf in Nantes, in which he advocated oral methods for educating the deaf: “After leaving school the students will be able to learn sign language which will allow them to communicate with each other at a distance. Lip reading can only be learned if the teacher avoids as many gestures or signs as possible. It requires too much attention focused on the lips and their movement.” It is interesting that La Fonta supported so whole-heartedly the English and German method of oral communication and lip-reading, to the exclusion of the French method of signs and speech, at least in the classroom. He was part of a controversy over methods in deaf education that continues to this day. Signs, for La Fonta, were not for learning the French language. Learning French was very difficult for deaf students who had to focus on oral language and its written counterpart through the easily confused visual shapes of the lips and tongue. He found signs useful, however, for communication exclusively between deaf people or for communicating ideas at a distance–for example while preaching. Jean-Marie devoted himself entirely to teaching the deaf. He loved them because he knew their needs, he became closely associated with them… In the short span of his priestly life, Jean-Marie planted the seed. He never knew the growth that followed. It was left to others to nurture the apostolate he had begun. May my death call forth a new deaf-mute priest, for they truly need one. Among the documents I discovered during my recent trip to the Deaf Catholic Archives in Massachusetts was a biography of the first priest who was born deaf, Fr. Charles Jean-Marie La Fonta (1878-1927). The book is called Un Miracle de la Foi. Un Sourd-Muet Devenu Pretre — A Miracle of Faith, A Deaf-Mute Becomes a Priest, by Mme. Raoul de Chaunac-Lanzac (1930, Paris). In the 1970’s, Sr. Elizabeth Kass found this rare book in a Canadian convent, photocopied it, and gave it to Fr. Joseph Bruce for the Deaf Catholic Archives. He had it translated by Joseph D. Gauthier, a fellow Jesuit. Four installments were published in Listening magazine, a publication of the National Catholic Office for the Deaf, but Gauthier’s manuscript is the only complete English translation. 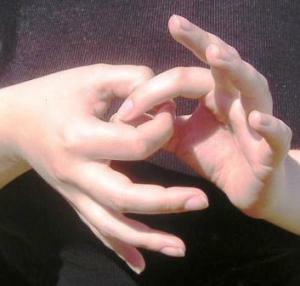 The book illustrates some common misconceptions that deaf people have faced. For example, the term “deaf-mute” was commonly used in the 1800s and the first half of the 20th century to refer to all deaf people–whether or not they could speak. Mme. Chaunac-Lanzac’s biography often refers to Charles La Fonta’s deafness as an “infirmity,” as if being born deaf meant being permanently sick. However, Mme. Chaunac-Lanzac also carefully describes Fr. La Fonta’s decades of grueling training in spoken elocution, as well as his ceaseless dedication to preaching to the deaf after his ordination in 1921 (in both spoken word and sign language). For anyone interested in rhetoric, deaf studies, pulpit oratory, or Church history, Fr. La Fonta’s rhetorical education and his preaching are jewels of interest and inspiration. Although he was a prayerful boy, the presumption for La Fonta and his family was that a deaf man simply could not be a priest. At a very early age, Charles amused himself by saying Mass. The boy prepared everything on the table and with genuine respect, imitated the priest at the altar… His mother was deeply pleased by her son’s piety, regretting meanwhile that his deafness would not allow him to attain the priesthood. The Superior of the Institute for Deaf-mutes, Mother Angelique, encouraged the young mother and Sister Philippe outlined the program of studies. In Paris, Mlle Dubois, by another method, obtained softer tones in the voice. With such teachers, Charles’ pronunciation became clear, articulate and soft. Charles understood everything and made himself understood. In the way he shared in a general conversation, one would never have imagined that he was deaf. Furthermore, he led the same life as his brothers and sisters. Although Charles had great concentration and worked harder and longer than his hearing peers at school, he was well-adjusted and accepting of his deafness. When he was fourteen years old, he told his sister, “I do not ask for a cure. I would not want Our Lady to make that a condition for becoming a priest.” Even this young, Charles knew that he could set a precedent for deaf people after him. In his preparation for college, Charles studied mathematics, history, English, and Latin. He finally enrolled in the University of Bordeaux in 1898, when he was 20 years old, and completed his studies with honors. In 1899 he attended the Institute of Agriculture at Beauvais, where he always sat in the front row. “He lost none of the lecture, following the movement of the lips with great concentration, thus using his eyes to replace his hearing. Then he would borrow his neighbor’s written notes, enlarge on them and if need be, he would go to the professor for further clarification.” In July of 1901 he graduated second in his class. You see that our prayers have not been fully answered. We just continue to pray with great patience. The Consultors feel it is better not to pursue the request for the priesthood at this time. They feel it would be better to wait a little while so that I can learn to pronounce perfectly and thus make a better impression on the examining bishop, who might happen to be very exacting. Dear Mother, I’d do anything to help you bear this cross. I have made a novena asking for the healing of my ears. I will continue again and again until God hears me. Please ask the little deaf-mute (girls) of Bordeaux to pray for this intention. Should the Assumptionists decide not to keep me, I would be deeply sorrowful and would be loathe to accept the separation…I will certainly suffer many contradictions and many criticisms. They do not bother me in the least, since God wanted me. The answer was not a surprise to me. The cardinals must have thought that the deaf-mute in question, although better trained than most, did not posses the necessary aptitudes nor a suitable pronunciation. They must have said: Ma nono tutti matti! They are all mad! Not having seen me, they based their decision on generalities. …If the Roman congregations persist in their refusal, in order not to create a precedent, then the only way to know God’s will is to speak to the Holy Father himself. Several Roman congregations decided that there was no incompatibility between the sacerdotal functions and deafness. As Jesus said to the deaf man in the Gospel of Mark, “Ephphatha!” — Be opened! The way for other deaf priests was opened by the hard-earned ordination of Fr. Jean-Marie La Fonta, but it was the prayerful perseverance and faith of this gentle man that opened the closed mindset of society at large about deafness and religious ritual. Immediately Fr. La Fonta began to minister to and preach to the deaf. As the next post to Word & Sign will show, Fr. La Fonta made ministry to the deaf his constant, driving work as a priest. For about a year now, I have been attending Sunday services at a church for the deaf in Landover, Maryland. Although I can hear and I came to St. Francis of Assisi as a mother seeking religious education for my deaf child, I was drawn in by the homilies of the two priests who use sign language with this congregation. In my work as a university professor, I study the history of rhetoric, a history in which the deaf are largely ignored. Yet here were deaf preachers who are clearly eloquent. After I sat through a year of such homilies, I began to grasp the idea of deaf eloquence–that is, persuasive and strikingly appropriate language produced for audiences primarily of deaf people. I interviewed Fr. Joe Bruce, a deaf priest at St. Francis of Assisi, for an article in America magazine. From Fr. Joe, I learned about the Deaf Catholic Archives at Holy Cross College in Massachusetts, a large collection on deaf ministries. This January, I made the first of many journeys to come from my home in Silver Spring to the archives. Eventually I hope to write a history of deafness in the Church in America, but deaf vocations to the priesthood are actually a recent phenomenon. There are currently 18 Catholic priests in the world who were deaf as small children (prelingually deaf), and who therefore have language differences that make them part of the deaf communities in their countries. Among this small number, there are deaf priests from South Africa, Uganda, China, New Zealand, Brazil, Cuba, and England. There are 11 in North America, including one in Canada. One grew up Baptist, and another was born to Jewish parents. One, the writer of an amazing autobiography, is the only deaf-blind priest in the world. What can a scholar of the “art of speaking well” learn from deaf preachers who communicate silently to a deaf congregation? The more I think about this question, the more fascinated I become. Eloquence is more than high style and forceful words. So often rhetorical criticism focuses on the parts of invention, arrangement, delivery, and style that take the sense of hearing for granted. And yet, humans have and can learn through four other senses. What can be learned about the senses of sight, smell, and touch in eloquence by watching the deaf preacher successfully move a deaf audience? Are there theological gleanings to be gathered by pondering deafness in the context of religious communication? And what can this teach all of us about being human? In the next several posts on this blog, I will be introducing material that I found in the Deaf Catholic Archives. This material includes manuscripts on the idea of God to deaf people, hundred-year-old newspapers for deaf Catholics, and a large collection of 20th-century newsletters and journals for readers in the deaf community. Catholic schools for the deaf are documented in plenty, and sign language for religious purposes is illustrated from its early days in America. Because my first project is to write a book of biographical essays on deaf priests, I will begin by describing some sources relating to these 18 men. Each one has an extraordinary story, and each offers food for thought about the nature of eloquence. I will begin with the first tomorrow: an 1830 biography of Jean-Marie La Fonta, ordained a Father of the Assumption in France in 1921.